My love of wildlife and the outdoors quickly led to an interest in photographing the world around me, and over the years my photography has become a never ending search to capture the moods and wildlife of Africa and elsewhere. This interest has led to a full portfolio covering much of the flora, fauna, culture, and heritage of Southern Africa. 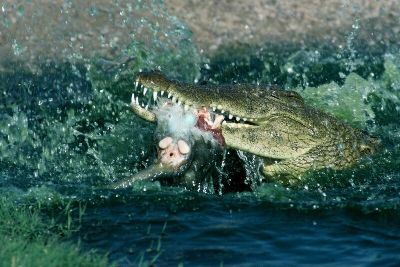 I have also won several awards in various photographic competitions and was winner of the 1996 Agfa Wildlife Photographer of the Year Award with the photograph below of a crocodile with its prey, a less fortunate vervet monkey. My photos are now available through numerous international photo agencies in London,Hong Kong, New York, Cape Town, Harare, etc. These cover a wide and diverse area of interests, including digital and 35mm transparencies. I have recently spent a lot of time getting my library of photos digitalised, as well as including digital photography in my new material. The result is that over three and a half thousand images are available on the web links below. The largest number and the greatest variation are available from the Alamy link below. To view the selection of high resolution files available, click the link and then type my name into the seach box. If you want to narrow it down keyword the subject or animal you are interested in. It's that easy! Anyone interested in these or other photos or prints please contact me direct via the e-mail link.